Here is a terrible thought. You just married your sweetheart and the two of you are walking along the water’s edge on one of Maui’s beautiful beaches. Your photographer approaches and mentions that his one and only camera stopped functioning sometime during the ceremony, they are not sure exactly when… they apologize and really mean it, but really? Did it have to be this way? How will your professional photographer deal with a major equipment failure? 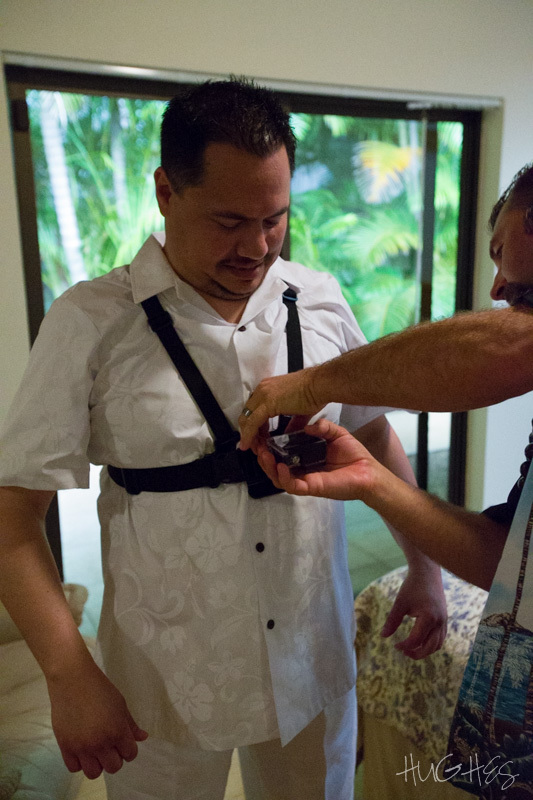 If you are thinking, ‘what can go wrong?’, let me tell you the ways and please realize that each problem could be a disaster if the photography of your Hawaii wedding matters to you! Catastrophic camera failure. Example: During the post ceremony cocktail hour at Olowalu, our second photographer runs over to me and says, ‘the camera sounds different’. Sure enough it did sound odd and a quick peak at the screen told the story. The shutter of the $4K camera decided to give it up with NO notice. A back up camera came out of the nearby equipment case and she resumed photographing. Dead batteries. This category involves a number of devices that rely on batteries to make those things work! And most batteries or devices don’t provide a lot of warning. Since we put away our medium format film cameras in 2001 and now rely primarily on 1-Series pro Canon digital cameras, each of which depends on a particular battery (not convenient store available) to operate. We carry two to four back up batteries, depending on how many cameras are in use. Out of film/storage space? When I first began covering weddings professionally, the studio gave me ‘a sufficient’ amount of film. Geez… that does not open up the creative faucet! Storage. These days that means fast CF and now fast CFast cards. My primary camera has two 64Gb cards. We have set our Canon 1Dx2 camera to write to both cards all images. Same settings are applied to the 1Dx. If one card goes bad, the other card is our back up storage and has all of our images! Our other cameras are similarly fitted. Although I rarely need to change cards in the middle of an event, I do carry additional cards. This is not our suggested approach! We bring back ups and double back ups of each mission critical component. Realize, it’s not if the equipment will fail, it is when the equipment will fail. Back ups, spares, call each what you want, but be sure to ask your photographer about their back ups. If they say, ‘I’ve never had a problem with using only one camera’, my experience suggests that you may want to continue the search for your photographer. We at Hughes Photographics are like the Boy Scouts, we are prepared wedding photographers.